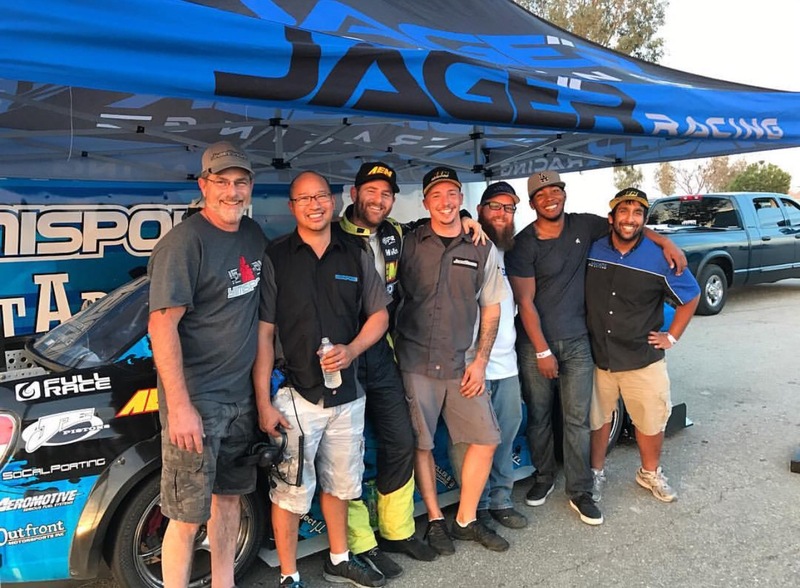 Since then, the car has changed immensely through the support of people such as my wife Rachel, Paul Leung of Yimi Sport, Gil Martin, Ken Kasitz, Rami E., Rob Campbell, Oscar Huicochea, Aaron Gillis, Mike Jager, Nick Holloway and many more. After a very hard 2015 season, if I can even call it that, the team pushed to make our 2016 season really pay off. We made some improvements to the car including pinning the mains on our Outfront Motorsports block and installing a dry sump to ensure our car’s reliability. Along with those changes we have been stepping up our data game; with the hard work from Rami and the use of AEM electronics AQ-1’s, we have been learning much more at every event that we attended. Our ability to examine what is going on within the motor and with other attributes of the car vastly increased our ability to make beneficial changes to the car. Our command center is full of some of the smartest people that I could find and together we pursue the ever constant question– how can we go faster? Right before Super Lap, we bolted on a new set of Mann Engineering coilovers with Swift Springs, so this meant that we had to work quickly to get them dialed in. We also did slight modifications to our aero package which allowed our Wasp Composites splitter to give us some additional downforce. For once, we showed up the night before rather early making it there before 11pm. So with a good night’s sleep, we all were able to show up to the track with only one Starbucks cup each. With prep of the car complete, we were excited to head out into the first session on some old tires and instantly we saw the potential with the car. We started to make our changes to drop time. The first day of the event was definitely still a major test session for us; we continued to try and improve and test our modifications. Some may say our splitter is too large, I just think they have splitter envy. At the end of the first day we were sitting in the lead with a 1:43.995 although we knew that we had much more in the car. Now on the second day it was time for Paul to turn up the boost and see what the car was really capable of. So with our BorgWarner turbo turned up to 11, we were able to lay down a 1:41.309! This was an incredible time; the fastest of the event and the 5th fastest time ever in Time Attack history. It is incredible to be up with the likes of Billy Johnson, Jeff Westphal, Cole Powelson and David Empringham. These are the guys that I have looked up to for years and dreamed to be in the same league with. It was unusually hot this year, making us believe that the midday sessions were only going to be good for practice and figuring our ways to find some time in the last session of the day. We continued throughout the day to figure out ways that we could drop more time and readied for the last session of the day. Of course with all of our preparation, one final thing sprung up right as we were about to go out for the last session. Gil and Paul pressed to repair the boost line fitting to get us out in the front of the group. With moments to spare, I was out in front and hitting the track. We knew from past experiences our friends and competitors Professional Awesome are a team that never quits and gets faster every session, motivating us to push ourselves as hard as possible… and what a session it was! As I prepared for my first hot lap, tensions were high and fast laps were on the horizon. Speaking of horizons, the lighting in the last session was down right astounding providing us with iconic photos. With my first lap of the session not besting my lap from earlier in the day, I did a cool down lap and prepared for another. With another hot lap completed the tires needed to be bleed off providing us with another opportunity. As I head back out onto the track I knew time was winding down, but midway through the lap I experienced fuel cut. This was due to running out of fuel, thankfully our fueling setup with aeromotive pro series pump uses every lap drop and I quickly came into the pits and the guys rushed back to do some refueling in an effort to give us one more shot. At the same time, Professional Awesome was in for refueling as well and they went back out just minutes before us. As we noticed when we were refueling, the transmission temperature was quickly getting too hot but we pressed in search of that fast lap. But after the warm up lap and then into turn 1 and turn 2 it wasn’t able to perform letting the stock center diff plates slip and thus ending the lap. Without a doubt this was one of the most exciting sessions in Time Attack! As I pulled off track, I could see the smiles on the guys’ faces ensuring me that we had done it! We had become one of the few that have taken home the top spot at Global Time Attack Super Lap Battle. This is an achievement that I am beyond excited about, to be able to see all the labor, time, energy, and give the Team the recognition that they deserve. A huge congratulations to Paul of Yimi Sport for all the years and years of hard work that he has put into this program. Without a doubt, I have to thank all the sponsors that believe in our team and our abilities! This entry was posted in 2016 Season, Events, Global Time Attack, Super Lap Battle and tagged attack, battle, global, lap, sport, sti, subaru, super, time, victory, wrx, yimi, yimisport. Bookmark the permalink.